and Arawak Indians had small settlements here about 1,000 years ago. In the 17th Century, Quaker pioneers came to Jost and established plantations that became dependent on slave labor.With the emancipation of slaves in the 1830s, according to the ruling British government, these plantations withered away leaving behind ruins we can see today, plus an island population of West Indians. Until the mid-20th century, the islands residents survived, and even thrived, with farming, raising cattle and goats, and fishing with the support of exports to larger neighboring islands. In the 1960s, however, these exports declined to zero in the face of government rules in the U.S. Virgin Islands. 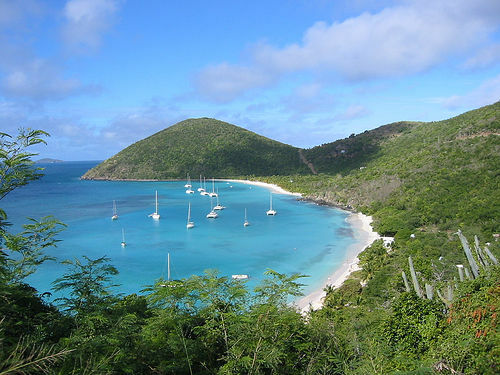 the wide variety of day and night entertainment, and the beauty of its beaches and small nearby islands, Jost Van Dyke is a must-see destination. Development of the island has been slow compared to its larger nearby neighbors, Tortola and St. Thomas. Electricity arrived on the island in 1992, and a water system started operation in 2003. Most of the land on Jost belongs to BVI citizens and their families and local laws constrain outside investment. As a result, Jost is still lightly developed, but the unwavering pressure for growth is evident. Jost Van Dyke is one of the last islands to reflect the life and beauty of the Caribbean. It is still a friendly community of nearly 300 residents with memories and love for an unhurried life. One of its beaches has been named one of the 10 best in the Caribbean. Accessible coral reefs beg to be explored by snorkelers and divers. Small islands beckon boaters to stop by for a break on their white sand. Nearly untouched hills offer miles of hiking and the charms of bird watching and floral beauty. It is this island that is the focus for preservation of the Society. Despite its three centuries of modern habitation, Jost Van Dyke has only been lightly developed, with economic growth proceeding at a slower pace compared to its larger, nearby neighbours—Tortola in the BVI and St. Thomas in the U.S. Virgin Islands. Much of the island’s environmental and cultural elements remain relatively untouched; its lifestyle seems less hurried and stressful than on more developed Caribbean islands. Yet the pressures for change and growth are also evident; for example, in a recent proposal for locating a small cruise ship dock on the island, in the grandfathered approval of a development near a salt pond and a reef outcropping, in the incremental filling of mangrove swamps, in the inattention to solid waste disposal rules, and in the casual cutting of roads, just to name a few. The long-term implications of these and other economically-driven actions are not fully understood by the island’s residents. Jost Van Dyke finds itself positioned between a past it does not want to lose or squander and a future that promises more options with expanded growth.